I lamented on the use of referrals and how ICC should prompt the use of technology to the fullest extent in cricket last year during the fourth test between West Indies and England at Bridgetown,Barbados.Daryl Harper, the TV umpire from Australia was at the hot seat for a period of play on the final session of the third day during that Test when he gave two absolute shockers which baffled one and all. As the year went by ICC had realized the importance of technology and to eradicate umpiring errors implemented the UDRS (Umpire Decision review system) from October 2009. When this announcement came out, I was elated that ICC had taken the step in the right direction to help the game, the players, the umpires and the fans. However the recent use of the system by players and the umpires leaves a lot to be desired. One thing is certain though, it is severely abused by the umpires who are both clueless and do not know how to use the system. I would not blame the players for they are on the field to play, nevertheless the knowledge or the lack thereof of the ICC officials are quiet amusing; Speaking of the system, the UDRS prompted an international umpire to retire from cricket because he could not handle the fact that his colleague over-turned his decision not once but twice, although he cited other reasons for his retirement and to add comic relief Daryl Harper was yet again in the hot seat as I write this article having failed to turn up his TV volume which let the South African captain Graeme Smith off the hook in the last Test between England and South Africa at Johannesburg. There is nothing so wrong with the system that it couldn’t be put right with additional training and some adjustments, however the fact that the ICC has asked the boards of the host countries to foot the bill has caused concern and has thrown the UDRS in a mess. This is a bizarre approach and not surprisingly the BCCI did not pay heed to ICC’s words and went on with their merry way of not having the system in place for the India-Sri Lanka Test series, whereas it was in place for all the other Test matches played around the world during that time.If a system is used in Melbourne and not in Mumbai there is no use in having such a system, what is good for the goose should be good for the gander too and the ICC should have had the fortitude to tell BCCI to implement it lest the Test matches would be deemed unofficial.In fact India become numero uno in Tests without the UDRS. Hurrah!! !It was an irony of sorts, for India and Sri Lanka were the two teams initially involved when the referral system was used unofficially and when ICC implemented it officially they decided to dump it.I’m digressing here as there is nothing official about BCCI. Before letting my anger on the current UDRS, it’s the “elite umpires” who are the root cause to undermine the system. The UDRS without doubt would eliminate obvious howlers like overturning an LBW decision when a batsman inside edges the ball on to his pads or to declare a batsman not out caught behind when the umpire fails to catch the inside edge or vice-versa.That does not mean that a marginal dodgy decision can still be made, this is the part where the ICC and their officials do not quite understand it. The TV Umpires do not have a consistent policy when overruling decisions. The current system clearly states that the TV umpire can give advice to the on field umpire to overturn the original decision when there is 100% compelling evidence; The basic premise of the system is flawed since the system is not getting us the right decision instead is validating the umpire’s call whether it was good or bad. What happens under this scenario is when there is no compelling evidence a right decision stays as is and so does a wrong decision and two wrongs do not make a right. A classic example would be when a marginal decision, say an LBW that would have clipped the bail is given out by the on-field umpire the TV umpire would have no choice but to uphold the decision and conversely if the on-field umpire had given it not out it would still not be over-turned.There is a huge potential for misinterpretation of this rule in this case and these need to be more consistent, well defined and well-tuned. The UDRS is a welcome change to the game; however the UDRS in its present form needs fine tuning.Firstly, they should have a separate TV umpire panel. This panel should not be from the so called “elite umpires” and they should be independent, for the TV Umpire needs to think differently from the on field umpire, Whereas the likes of Harper and Asad Rauf are second guessing their colleagues in the middle and are making decision based on what they would have done if they were on the field. The TV Umpire should be trained in the use of various tools to aid the on-field umpires apart from knowing the rules of the game. All he should be required to know is to use and interpret the various tools and technologies like super slow motion, hotspot, snickometer and hawk-eye and arrive at a decision that can be conveyed to the on field umpire. Although this could effectively pit the on-field and TV umpires against each other, this should be adopted until all of the “elite umpires” are well trained to use the system and reach a point of confidence that they can think like a TV umpire. Secondly the number of challenges should be increased to three per innings. As soon as a decision is made on the field, an amber light should flash for 15 seconds and the challenge should be made within that time by the batsman or the fielding team and no appeal cannot be made after that 15 seconds. Then the TV Umpire in conjunction with the Match Referee should review the decision using all available tools. The dismissed batsman can stand his ground until the review is made and the on-field decision should be over-turned when there is evidence that the original decision was wrong and the rules need to be well-defined for marginal decisions. Some may argue that marginal decisions have always been part of the game; however the aim is to rely on technology 100% and make it accurate and not rely on some old men doing pure guess work. The TV umpire should be provided with all the tools to complete the decision-making process effectively and all this should not take more than three minutes if handled properly and effectively. This should all work out smoothly once the personnel involved are well trained and the technology is used to the fullest extent. Thirdly teams should be allowed to carry over any unused challenges in to their next innings, since I strongly feel that the players should be entitled to appeal as much as they can and there is no harm in letting a team carry over unused referrals. It’s after all theirs like cell phone minutes although many people might not agree with that analogy. In this modern age and day it’s hard to comprehend why some people are so against the use of technology. If the use of technology renders the on-field umpires as mere coat stands so be it. However we are hearing arguments from various quarters who think that “it undermines the authority of the umpire”. One of the most renowned umpires of our time Dickie Bird went to the extent of saying “In the old days, controversial decisions became talking points in the bars and clubs but everybody respected the umpire’s authority”. Well Dickie, we are not in olden days and people can still talk about how the right decision was made in bars and clubs. There is one section that puts out the argument that that technology is not 100% accurate, but at least we can be sure that with technology there is no second guessing involved by a human being and the ECB chairman Giles Clarke after Harper’s shenanigans in Johannesburg made possibly one of the stupidest statements when he said “If the umpire is as deaf as a post and as blind as a bat at least it’s the same for both sides.” So shall we put a bat and a post to umpire then? I really don’t know what these people are trying to accomplish, they are either living in the past or living in denial. The argument about the use of technology slowing down the game by taking a long time does not hold good when a decision to validate whether a fielder has touched the boundary or not takes ages, What is all the more baffling is even when a team requires 130 runs in four overs to win a Test match the umpires validate this, I’m not exaggerating for this happened during the recently concluded Adelaide Test between West Indies and Australia when runs did not matter and for all purposes the game was meandering towards a draw. A player should not be deprived of a chance to entertain the paying spectator because of the old stale argument “Umpires are humans and they make mistakes” and “Umpiring Mistakes” are part of the game and it will even out at the end of the day. It will not even out and if any it is detrimental to the game. The umpire is there to assist and make the right decision not throw in a random variable by making an appalling decision to kill the game as a contest. As the great W.G. Grace once supposedly said to an umpire “They are here to see me play not you umpire” should be the mantra of the ICC going forward. Some good insights there Ganesh. But, T20 is FAST game. You probably wont want anything to slow things down in T20 and therefore no UDRS in T20 is fine by me. ICC’s figures say 92% without and 97% with. Without the system, there is a very real possibility of me starting not to care if another Sydney happens. I don’t see the point in following a sport if the administrators don’t care about someone other than the players deciding the outcome of a game. I was appalled when they announced the introduction of thr UDRS in test cricket. With the game the way it is at the moment the last thing it needed was something else to slow it down. Now that it has been in place a while I have seen nothing that would make me change my mind. 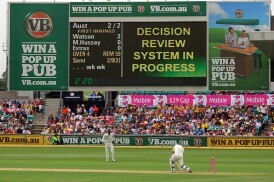 According to the ICCs own figures test umpires get 97% of all decisions correct without the use of this system. I think 3% is an acceptable tolerance. The UDRS was introduced, supposedly, to eliminate the blatantly obvious bad decisions that do occur on rare occassions but is being abused by the players who use it to try to get reasonable decisions overturned. If they are going to continue with this system some serious changes need to be made to it. Firstly eliminate the player involvement and make it the responsibility of the third umpire to closely monitor all decisions and if they spot something that is suspect they can notify the onfield umpire to stop play while they have a look. Secondly this eliminates the onfield adudicator from the process as well. This will eradicate most of the pointless stoppages and keep the game flowing much more freely. Most of the time they would know if the umps call was right or wrong before the bowler gets back to his mark anyway. I dont know if most people would agree with me as I seem to be part of a minority in this but the thing that really bugs me is the people who so strongly advocated for the introduction of this system. The greatest lobbiests for the UDRS were mainly former players. The same players who are largely employed as commentators by the television networks. The same networks that own the technology and are paid handsomely for its use. My personal opinion is that it was the greatest con job in sporting history. If they seriously want to use technology to assist the umpires rather than the commentators there are a host of things they could utilise. The simplest of these would be laser lights indicating the line of the stumps, as with most laser levels outside, the beam is only visible through special sun glasses. The bowlers foot could also be monitored by lasers to assist in the detection of noballs. Throw in a couple of height ones as well for the square leg ump for such things as over waist full tosses, bouncers and such. But none of this would aid the broadcasters so are very unlikely to happen.